REAL is developing its Environment Centre on the 85 William St. site to feature practical environmental solutions that people can model in their homes and communities. In 2008 the REAL Deal Reuse Store moved to its current location, a former Smiths Falls Public Works building. The building happened to be located on a three acre naturalized parcel of land, adjacent to a significant wetland known as “The Swale”. REAL saw the many possibilities the site offered for introducing the public to environmental concepts by providing information, demonstrations, opportunities and workshops all in one place, creating an environmental centre for the region. REAL Deal Reuse Store. The most well-known feature of the site is the REAL Deal Reuse Store , which accepts and sells gently used goods, ensuring that reusable and restorable items are kept out of landfills. Read more. Electronic Waste Collection. On site is an OES (Ontario Electronic Stewardship) electronics waste collection bin. Materials are accepted during store hours and shipped to OES facilities for proper recycling. You do not need to be a resident of Smiths Falls to use this service. Read more. Other Waste Materials. The REAL Deal Reuse Store also accepts other waste items such as batteries, print cartridges, scrap wire and metal, mercury thermostats,milk bags, and used writing instruments for recycling. We will also accept clean, used grocery bags for customer purchases. Read more. Compost Demonstration Site. REAL has put in a compost shelter next to the community garden, that will demonstrate several different styles of composters. We hope to offer compost workshops there. Monarch Butterfly / Pollinator Garden. In celebration of REAL’s 30th anniversary in 2019, we are planning a new garden between the building and William Street. Native Garden. A garden planted along the front of the building demonstrates the benefits of native gardening. REAL Community Garden. 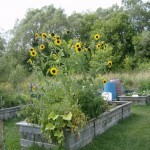 Eleven garden plots are available to individuals or groups who want to plan, plant, maintain and harvest their own plot. One plot, the Stone Soup Sharing plot, is for the community to access. Read more. Heritage Fence. Four workshops over 2011 and 2012 demonstrated heritage fence building techniques. The three styles of cedar rail fence provide an attractive enclosure around the community garden. See some photos. Recycled Junk Art. Six panels of junk art by local artist Val Hudson are displayed on the north exterior wall. Some panels were removed and repaired in late 2016. Read more. Mural. An attractive mural by local SFDCI high school students portrays the environmental past, present and future of their community. Rainwater Garden. A rain water garden was established on the property to demonstrate this gardening technique that slows down runoff, allows more rain water to percolate into the ground to be filtered and recharge groundwater, effectively reducing the pollutants that enter our waterways. Unfortunately, the area has grown over. Thermal Solar Panels. A solar thermal wall is at the rear of the REAL Deal store. Two thermal panels on the south wall trap heat that is blown into the building, supplementing the existing heating system. It makes a big difference on cold, sunny winter days. Some interpretive signage will be added in 2017. Workshops. Workshops are offered periodically on topics such as repurposing, energy conservation, urban water protection, and garden issues. These are usually free or very low cost. Watch the events listing on this website for upcoming workshops. We welcome your input and participation, and invite you to come see the features as they are added. Donations are gratefully accepted; a charitable receipt for income tax purposes can be provided. Find out how to donate.